It’s been tippling it down all night. The rain was so loud we struggled to sleep in the caravan last night. Splashing through the footbath, sorry the awning to the shower block, The Boss decides we need to go out later to escape this rain cloud that has decided to spend it’s holiday with us. 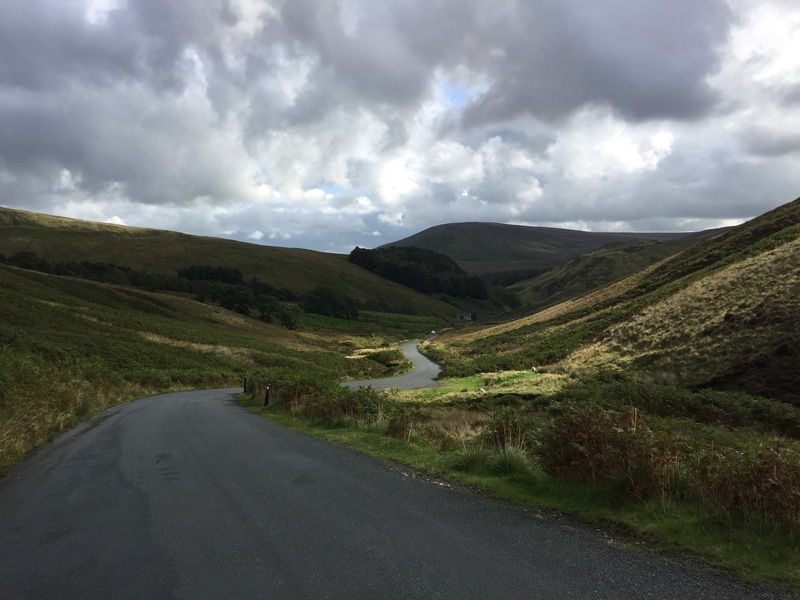 Car pointed in the direction of the Trough of Bowland we whizz through the wind and raindrops. We travelled from Clitheroe towards Lancaster following the route of the Pendle Witches to their trial at Lancaster Castle. The road is very narrow and steep. Today, it’s quiet, good job really as a few passing places are occupied by sheep. Sheep who just stand and look at you, maybe wondering why we’re daft enough to be out in this weather. 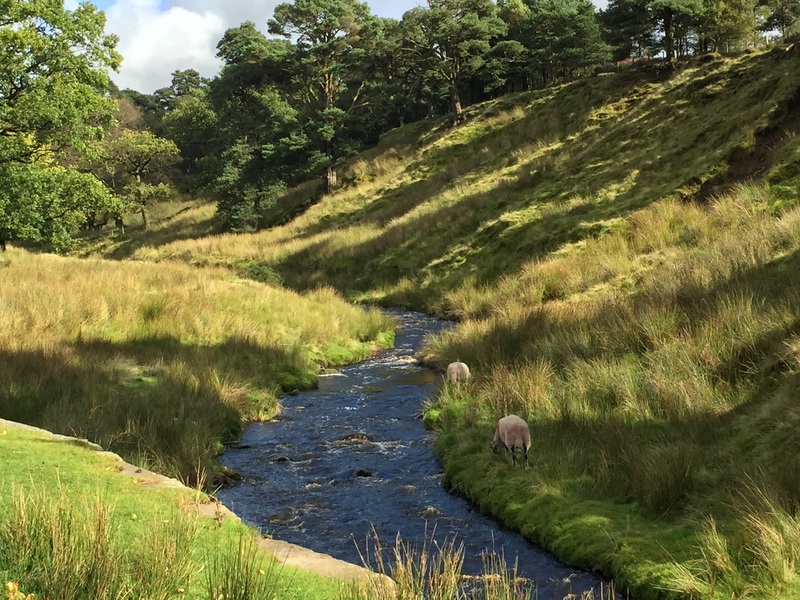 Swollen brooks thunder through the valleys, newly formed waterfalls cascade down the hills, the sheep, oblivious to the transformed beauty of their home just carry on munching. Not even stopping chomping as we jump out of the car to take another snapshot of nature at its best. Ashton’s Monument, a Folly, looms into view standing head and shoulders above the City of Lancaster. A city we’ve passed through many times but never really spent any time in. Today is no different we have a date with a bag of chips, sprinkled with salt and dripping in vinegar, on the sea front at Morecambe. 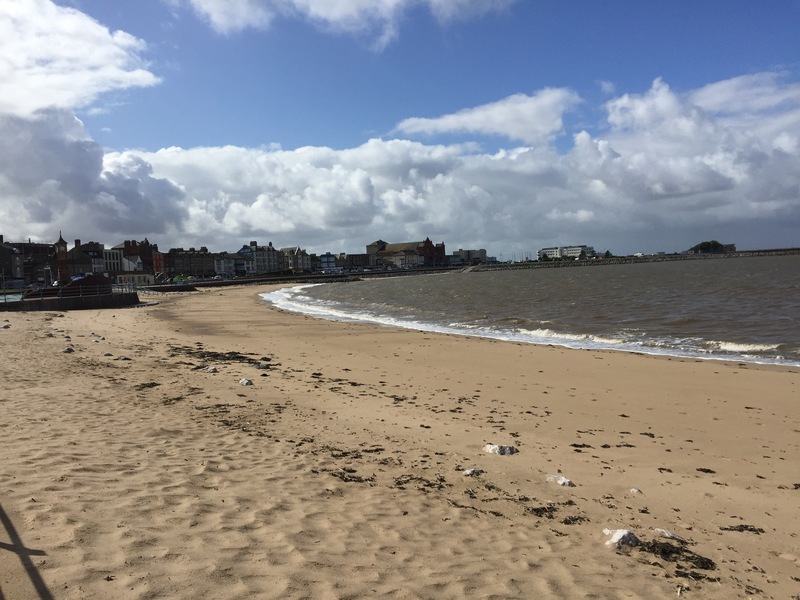 Due to the weather, Morecambe is quiet today. Everyone with any sense is snuggled up at home with a steaming hot brew and the heating on. Parking on the seafront is easy and we found a free space – bonus! The wind is blowing a hoolie, wrapped up to the nines in flip flops and shorts, (summer holidays still remember) and a big hoodie we venture onto the prom. The clouds have parted ever so slightly and the rain seems, for the time being, to be out at sea. A short walk down the front shows that Morecambe as a town is trying to entice the tourists in. 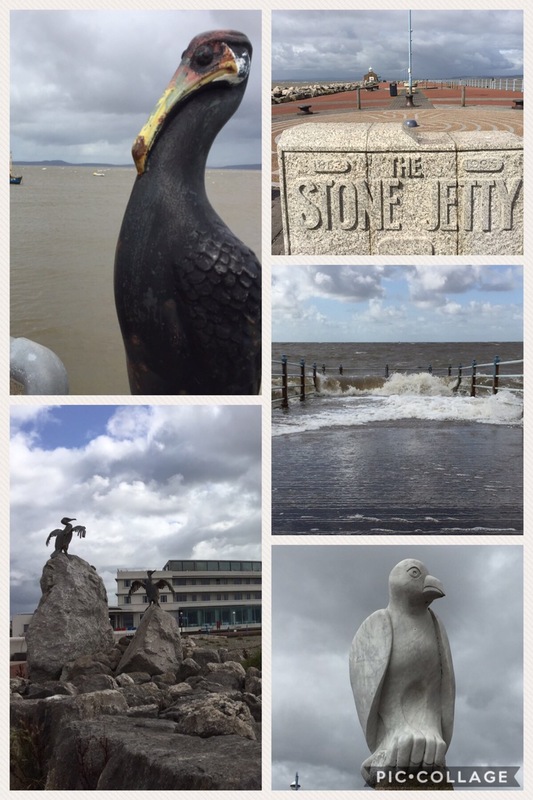 The prom itself is well laid out, with quirky cormorants, the Stone Jetty and of course good old Eric. 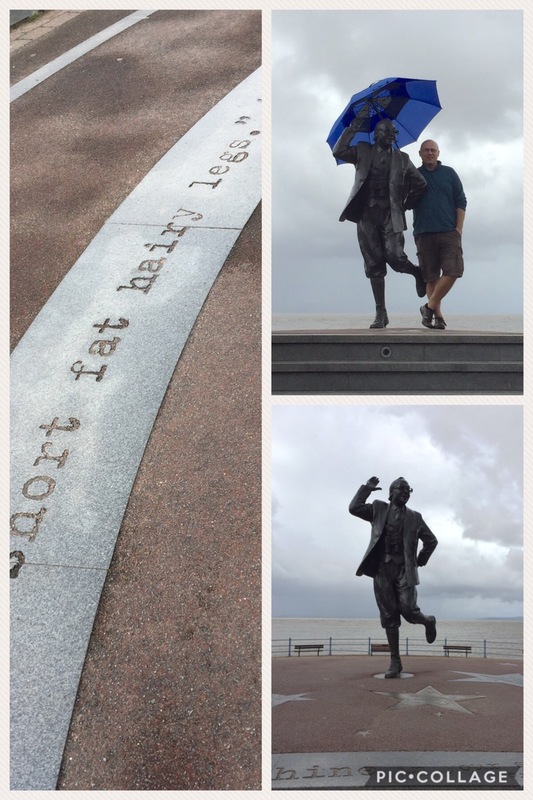 There is a statue of John Eric Bartholomew, Eric Morecambe, in his familiar pose with some of his best known quotes decoratively laid out before him on the floor. Unveiled by The Queen no less, the boy done good. People wait quietly in turn, terribly British, to pose with the famous icon. Just as it’s our turn big, fat raindrops start to fall. On the other side of the road, Morecambe is looking tired. The Winter Gardens looks in need of a bit of pampering, neighbouring chip shops, amusement arcades and seafront B&B’s all look like they could do with an overhaul. Chips bought from an old fashioned chippy, no burgers, pizza or chicken on their menu, a good old fashioned chippy. Perched on the steps behind Eric Morecambe we tuck in as the ever hopeful seagulls linger. Living in the south I love coming back for chips. Northern chips taste so much better. Chips also taste better out of the paper, on the seafront in a force 10 gale. A walk down the Stone Jetty proves bracing. Head on into the wind it whips my hair across my face, wish I had a bobble. The Boss doesn’t suffer with getting his fringe in his eyes. A lone fisherman sits patiently at the end of the Jetty as the wind fights with the waves on the slipway. He just sits, alone with his thoughts and only those pesky seagulls for company. On our way back to the prom, a man stops us to chat. An ex pat, living in South Africa since the early 70s. He regales us with the tale of his trip, how the UK isn’t as he remembers it. Not as quaint, more commercialised. He thanks us for our time and sets off, head down into the wind. Morecambe, you were everything I wanted out of a seafront and more out of a wet and windy, miserable afternoon. You provided a modern, clean promenade, not too fussy but something for everyone who enjoys a good promenade. Most of all you provided the best chips I had on my trip back home to the North West. On the way home we decided it was time we took a closer look at the monument dominating the Lancaster skyline. 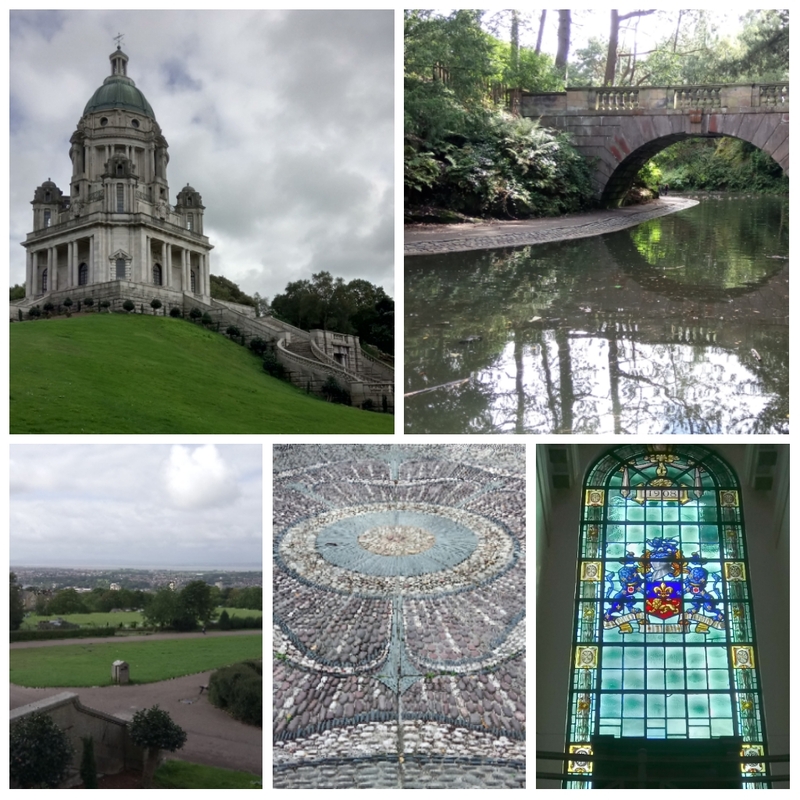 Williamson Park was originally created in the 19th century from a stone quarry to provide work and wages for local mill workers in hardship due to the ‘Cotton Famine’ resulting from the American Civil War. 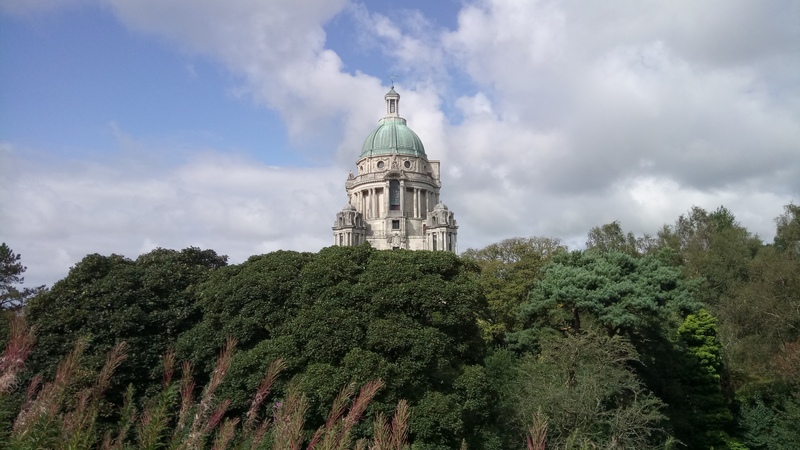 It’s centrepiece ‘The Ashton Memorial’ was later commissioned by Lord Ashton (James Williamson) reportedly as a memorial to his second wife, Jessie, and completed in 1909 at the equivalent cost of £7.5 million in today’s money. The story of Lord Ashton and the City of Lancaster makes interesting reading. Wonder if The Boss will build one for me when I’m pushing up the daisies. Love the umbrella – and the pics!